CiarÃ¡n Rooney just let us know about this meetup on this coming Saturday. Some of Irelandâ€™s finest and brightest webmasters, SEOers, SEMers, designers and developers are getting together next weekend for a meetup with people flying in from all over Europe. All details over on the Weeno blog. Given the number of Web2 companies here that use freelancers and outsourcers for many aspects of their businesses, would it make sense to have some sort of simple skills board (as opposed to jobs board) here? Even something as simple as a page with a list giving Company Name, Person Name, Services Offered, URL for contact info. We want to put together a consolidated email distribution list of web companies on the island to replace the mish-mash of lists each of us has at the minute. This would be very a very low volume editor-broadcast only list which would complement the blog and obviously would not be made available to anyone else. UPDATE: We’ve changed the sign-up due to the high demand. If you wish to be added to the list, please apply to join the Web2Ireland Google Group here. We’ll also email those of you we already know to see if you wish to be added. As a sweetener, Roomex has made a very kind offer of discounted hotel rooms to anyone who is on this web2 list. There is an extra discount if you get your name in to us and room booked by Thursday evening! We’ll forward the offer details as soon as you mail us. A big thanks to Jack Donaghy in Roomex for this. Irish startup nimble is making waves – and is a worthy competitor to the Bebo dominated Irish social network scene. We’ve written about the Eircom Web Innovation Fund before. The deadline for receipt of applications is 5pm on Friday 15th Feb. This is a fantastic opportunity if you have a great idea but not the funds to build something new. Remember, you don’t have to be a developer to get involved in this. If you think your idea has wings then try and find people of a similar mindset and apply together. An ideas person with some marketing cop-on along with a sharp developer is one combination that makes a lot of sense. It would also be fantastic to see teams from the third level postgrad programmes apply. So if you are in UCC, CIT, UCD, TCD etc etc etc , get that application in. The areas in which Eircom is particularly interested are Discovery, Messaging, Voice, Location, Publishing, Communities, Content creation, Advertising and Identity. 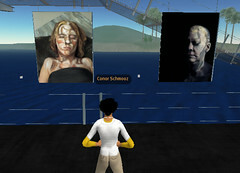 Haydn Shaughnessy has just launched the virtual art gallery Ten Cubed in Second Life. As a confirmed SL cynic, I wasn’t sure what to expect from this. However Haydn is one of the smartest guys around in media, tech and journalism so it had to be worth a look. I have to say it’s pretty damned awesome. The idea is radical but seems like a logical progression from e-commerce to v-commerce. You walk around a virtual gallery and look at the art hanging on the walls. Some of it exists in the “real world”, some of it only in Second Life. But here’s the twist – you can buy either! I initially didn’t understand the concept of buying virtual art but there are tons of companies with their own “offices” in SL who are spending hundreds of thousands of dollars getting them built. As with real buildings, these can only be improved with the addition of art. The advantage on the real-world side is that you can get a much better sense of the art hanging on a wall in 3-D than you can looking at flat scans on a web-site. Now I have all the artistic sensibilities of a corpse but there is some fantastic stuff in the gallery. I saw some of it when Haydn had the Gallery in Harbour View and it impresses just as much in a virtual setting. The other thing which is very obvious is the intelligent design of Ten Cubed. You have none of that usual 3-D world “where do I go?”. You are naturally guided in particular directions. Even if you just want to see what eBay might look like in five years time, it is well worth your while checking this out.